The MovieBuddy app for iPad, conceived and developed in part in Hawaii, takes a great thing and tries to make it even better. Netflix is everywhere. Not content to destroy the likes of Blockbuster, the DVD rental company is leading the way in the inevitable shift toward streaming media. Getting discs delivered to your mailbox was convenient. Having movies and TV shows delivered directly into your living room is revolutionary. Today you can watch Netflix via your DVD player, your Wii, your Playstation 3, even through a $60 Roku box or an internet-enabled TV. But arguably the most enticing delivery channel is Apple’s iPad, itself transforming how people interact with content at home and at work. But watching Netflix is one thing. Navigating its massive library and managing your queue (basically your to-do list or playlist) is another matter. And even though Netflix has its own official app, and even though you can browse titles and manage your account through any web browser, local developer and designer Brian Dote of Dotestudios and long-time collaborator Stéphane Lunati of San Francisco thought they could offer something better. Dote describes himself as a father, a photographer, an artist, a developer, a designer, a geek, and a gear head. He moved to Silicon Valley after earning his MSIS from Hawaii Pacific University, arriving just as the “dotcom boom” went bust, surviving the tech rollercoaster by working for companies ranging from startups to major players like Cisco and Apple. “I’ve experienced the explosive growth stages of startups, the implosions and downward death spirals, the round after round after round of layoffs, and the joy of options that turned paper into gold… and usually back to paper,” Dote said. Dote worked with Lunati during his time at Apple, both of them employed as engineers who found they had complimentary skill sets. While Dote worked on the UI for MobileMe, for example, Lunati was in charge of the backend WebObjects team. Their collaboration continues today, and remains successful even though they haven’t seen each other in person for more than three years now. The pair has already built several apps for the Apple iPhone platform, but MovieBuddy was their first app for the iPad. He envisioned the iPad equivalent of a DVD vending machine kiosk, “full of nicely rendered objects and glowing volumetric lighting.” As for the heavy lifting behind the scenes, Dote noted that MovieBuddy had a slight inside advantage. His partner had already done some work on a Netflix queue manager app while working as an engineer at Netflix. But a polished front end was definitely the priority. “My mantra is to create deliciously fun apps, ones with a few great features combined with slick lickable interfaces,” Dote said. The iPad offers a huge canvas to play with, a large screen to display more information, and more beautiful pictures. But it also presents challenges to developers making the leap from the much smaller iPhone. Still, the extra work paid off. When you launch MovieBuddy (and log into your Netflix account), the app starts by literally lifting the curtain on the Netflix library. There are fine touches like sharp graphics, spotlights and reflections, and to browse, you intuitively scroll and swipe through titles by category. You can also see your queue of upcoming DVDs, or switch to see what’s available for instant streaming. Clicking “Watch Now” launches the native Netflix app. Watch a brief video demo on YouTube. Of course, the native Netflix app offers the same functionality. More functionality, in fact, since it’s essentially the Netflix web interface, which allows you to manage your queue rather than just look at it. But when it comes to just looking, MovieBuddy still looks great. Though MovieBuddy was a good first foray into iPad development, Dote admits there have been significant challenges. Since launching MovieBuddy, Netflix twice changed the API — the ostensibly open connection points through which third-party developers can build upon their service. Both times, this crippled the streaming function of MovieBuddy, requiring them to code and submit an update and wait for Apple’s approval. In the mean time, the app was buried with negative reviews in iTunes. Nevertheless, sales have been good. Not great, but good. Considering that the Netflix app is free, I’m impressed that MovieBuddy — priced at $1.99 — sold at all. “We rose to #6 in the iPad entertainment category a few days after launch, and managed to get into the top 50 iPad apps based on overall sales,” Dote said. There had been over 4,000 downloads by late September. “The first weekend after launch was great, we were averaging a hundred or so downloads a day and things looked good. We were happy with the trending sales and were hopeful that we finally had a hit,” Dote said. And for a brief, shining moment, he actually believed that they did. He said he couldn’t resist doing some quick math. A thousand dollars a day for 365 days? He imagined taking his wife on a shopping spree. And the numbers kept rising fast. 400. 425. 475. 500! “That day felt like that dotcom commercial where the company launches a website and has a counter for sales. They’re watching the computer screen as the sales numbers start climbing, and climbing, and climbing. Let me tell you, this is an amazing feeling,” he said. MovieBuddy had been cracked by hackers, and uploaded to a site where people could download and install the app for free. Almost ready to quit his day job, Dote instead experienced firsthand the downside of hackers and jailbreakers dedicated to breaking out of the “walled garden” that Apple built for its devices. 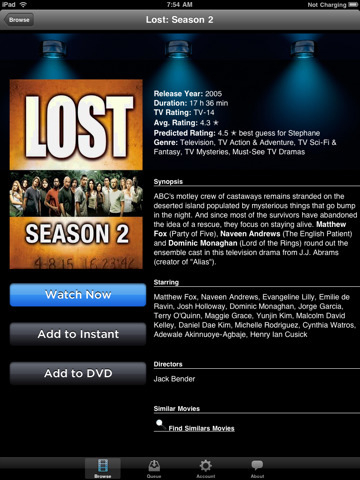 The latest update to MovieBuddy, version 1.2.2, was released on Oct. 6. Alas, it’s been again saddled by mostly negative ratings. Meanwhile, Netflix has been quickly improving its own free app, and just today, made it even easier to watch streaming content on Wii and PS3 devices. “Definitely don’t form a company around a product that depends on another company whose best interest is to build the app you’re building,” Dote concludes. But with over 15 iPhone apps (and a few web-based apps) under his belt, Dote is charging forward with a whole slew of new ideas. Hi Ryan, thank you for helping me share my story. I hope the next chapter is more successful =) Each step has been challenging, rewarding, and a great learning experience. Hope to make it back into your blog this December with the game I’m working on. Keep up the great insightful and inspiring blog!